Soon to be online at Ci2i Global, I've written about the work I've been doing for the past several years as a case study. Click the image above to see the presentation I gave about it. The text below appeared in a booklet of case study background information which participants at Ci2i Global's Learn/Share Lab for Co-creative Impact and Innovation also received earlier this month. 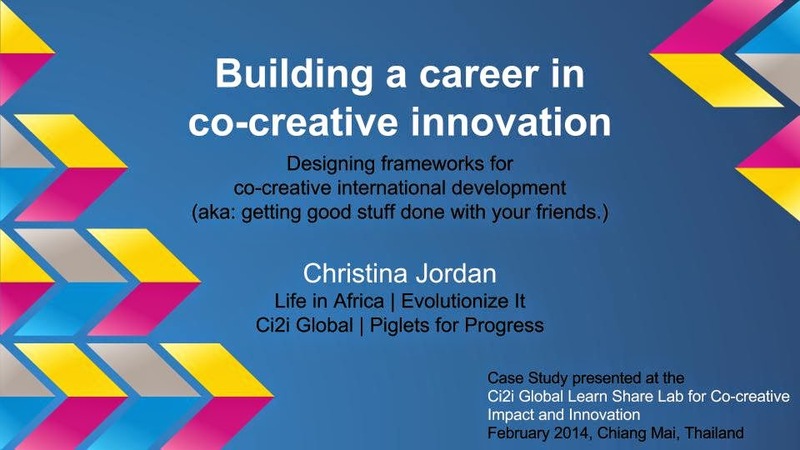 Ci2i Global Founder Christina Jordan’s career as a serial social entrepreneur in international development has spanned several continents, online spaces, container organizations and initiatives to impact globally marginalized local communities since 1999. She is also a passionate activist for collaborative professional development in the global changemaker space. More than looking at the background and impact of any of those individually, this case attempts to capture the evolution of an approach to professional career development that models, applies and supports co-creative approaches toward a desired shift in prevailing global development paradigms. New Life in Africa (Kampala, Uganda) is a community based organization of mostly war-affected displaced women who live/work at a stone quarry. The CBO devolved in 2008 out of the former Life in Africa Foundation, which Christina originally founded in 1999. Evolutionize It, ASBL (Belgium) was established in 2010 as a non-profit container that applies collaborative / co-creative skills developed in Africa to professional event design and facilitation assignments, while also enabling continued co-creative pro-bono work with New LiA and other groups. Ci2i Global was initiated as a support platform concept for social entrepreneurs in professional transition, and has evolved through the co-creative input of like-minded colleagues into a platform for the study/promotion/uplift of co-creative approaches, and support to professionals who design and employ them. Hundreds of online supporters have participated in unique frameworks for micro-giving and engaging in making a meaningful impact that Christina has designed through the above. Hundreds of families in marginalized communities have directly experienced the impact of evolutions in Christina’s career toward inclusive co-creative development models. More than a thousand changemakers have participated in event experiences that Christina has designed. Modeling for targeted local impact: Christina’s approach to working with marginalized local communities begins with co-creative dialogue and events designed to unearth community needs and self-perceived potential, in order to develop plans that can be “packaged” into unique opportunities for global supporters to engage around. An initially curated process for emergent outcomes thus shifts to an open process that invites co-creative global input in achieving the desired outcomes determined by the local community. As much agency as possible is left with the local community to implement their plans using inputs crowdsourced through Christina’s global networks. Nurturing replication/spread for global impact: Christina’s work in the global professional changemakers space uses art-of-hosting facilitation techniques and learning event/experience design to invite & nurture collaborative learning, co-creative planning and community building to support others who are actively engaged in shifting international development paradigms from top down to bottom up. Issues to be solved/addressed: 1) flipping the prevailing top-down design paradigm in how global resources can be channeled to support development in marginalized communities, 2) increasing the collective impact of the global changemaking space. Early objectives (at the start of the initiative): experiment with improved micro-finance opportunities, create opportunities for mainstream engagement in making a difference in the lives of the poor. Later objectives (developed/evolved through co-creative process): income generating skills/opportunity development, job creation, local community uplift, global community engagement, professional support to changemakers with similar approaches/objectives. Briefly describe the passion behind why this initiative was undertaken: The first 10 years of Christina’s career included experience working with (and witnessing the failure of) global development agencies including the UN, the EU, USAID and NGOs. She set out on her own to establish a social enterprise (Life in Africa Foundation) through which she could experiment with developing better models and approaches. What inspired the use of co-creative approaches in this work? : Impact of the Sept 11 attacks on Life in Africa’s online activities (initially NOT so co-creative in nature) prompted a complete shift in perspective on how to conceptualize local development that would be more resilient to external shocks. Nomination to the Ashoka Fellowship that same year opened a world of possibility and ideas with regard to what might be achieved through collaboration with other changemakers. Which established methods were drawn from in inviting co-creativity? Trial and error (including LOTS of mistakes & reinventions), deep listening, Open Space Technology, Art of hosting facilitation techniques..
Why was a co-creative approach deemed better in this case than a more traditional approach? Initially, it was really about sharing the risk and workload involved in managing a local development initiative, underpinned by an evolving sense that sustainability would be enhanced when the beneficiary community had a direct stake in the initiatives success or failure. Over time it became clear that beneficiary engagement generated impact in it’s own right. More lasting empowerment came through the discovery of voice, agency and talent in the co-creative community building process than through the income generating opportunities that the community was receiving and managing. What was the role of serendipity in guiding how this initiative unfolded? All of Christina’s work with marginalized communities has been born from serendipity - connecting with people in countries where she’s lived and listening to their stories has opened pathways of co-creative exploration around what might be done to nurture meaningful change. Her work with changemaker communities has been much more intentional and strategic, while still building on serendipitous relationships. Role of a leader, or a leading team, if any: Dialogue event & survey design, deep listening, digital storytelling, “packaging” of community objectives into micro-giving/crowdsourcing initiatives, training for the local use of online tools, strategic organizational development, connector/champion role. Were any funders involved in supporting the initiative? (When did they become involved?) Most initiatives have been funded through dispersed online global engagement strategies (including crowdfunding and community-crafted product sales). In 2006 and 2007 Life in Africa was a Community Favorite award recipient at Omidyar.net, resulting in $40,000 in external funding. Omidyar.net also provided $15,000 toward the costs of hosting an Open Space gathering of Onet and Life in Africa members in Northern Uganda. Evolutionize It channels fees earned on professional facilitation jobs toward defraying the costs of her co-creative experiments with Ci2i Global and Pigletsforprogress.org. On many occasions she has also self-financed the expenses involved in undertaking work she believes in. - meetings: Community planning meetings in Uganda and Thailand. In Uganda there were national planning meetings involving members at 2 locations. Social networks used: Omidyar.net (Uganda), Startsomegood (Thailand), Twitter & facebook (network outreach and professional development). Also used some early writers networks to share stories about Ugandan efforts (The Vines network & themestream). Methodology : how did co-creation materialize..
Impact measurement: While there have been a number of attempts to quantify the impact, the most meaningful impact has been the immeasurable kind of empowerment and confidence that changemakers and community members report anecdotally. Individuals in marginalized communities where Christina has worked report feeling respected and valued by being included in the development process; changemakers often report increased clarity on their personal/professional value and direction. Significant difficulties met: articulating an answer to the question “What do you do?” Financial uncertainty while exploring new models. Conflict with family members who did not understand. Repeatedly: conflict with project partners who did not agree with the principles of co-creative community control. Also, identifying the difference between corruption and lack of capacity within communities to achieve transparency, and adequately communicating with other stakeholders around that. - In Uganda there was a serious conflict between Life in Africa and a local partner, who perceived that the project had more money flow than it did, and fought viciously for a greater piece of that perceived pie. They argued that the community should not be responsible for managing it’s own finances and became quite deliberately destructive. Eventually, they wrote a project proposal that co-opted Life in Africa’s ideas as their own, received funding from an international agency and pushed the managing members of the Life in Africa community out of the project (which was at a rented location controlled by the partner in question). - Life in Africa Gulu eventually failed to be revived when the women elected the men to hold CBO management positions because of their perceived capacity to manage community affairs (numeracy and literacy), and the men then cheated the women out of resources. - After working with the community for over a year on co-creating a Life in africa Foundation transition plan (which included setting up a local CBO and a 501c3 structure in the US), conflict arose when the individuals who had committed to managing Life in Africa USA tossed out the community co-created plan and tried to implement their own ideas from the top down (which eventually failed). - Working with Ashoka on the Changemakers Week event there was a conflict between co-creative event design approaches and what Ashoka believed their corporate (sponsoring) participants would expect. Unfortunately, Fellows were not allowed to bring their own issues to the event as had been hoped. In the end, however, the most positive feedback received on the event was with regard to the co-creative facilitation approach of the sessions that Ashoka centrally decided to include in the program. Important in pursuing this career development path has been coming to peaceful terms with the flow of money in and out of the enabling equation, adopting a faith in the universe’s desire for this work to happen and it’s possibility to provide care and support in unexpected forms; Evolutionize It was created as an incorporated “container” for raising funds that can channel into co-creative endeavors. Curating the Ci2i Global group required formulating a vision around which to invite a co-creative conversation, and established networks of like-minded people to call to; PigletsforProgress was undertaken as a deliberately part-time/extra endeavor, which meant defining a container around the objectives and time available for it in advance - this would not have been possible without the many years of experience brought to the task. Timeframe : how long did it take between the idea and its implementation - co-creativity has played a major role in Christina’s approaches since 2002; working toward a shift in prevailing global development paradigms will remain a lifelong endeavor.